BECAUSE of her fake tears and claims of endorsement from tri-media personality Bobby Nalzaro, a 19-year-old swindler managed to victimize two barangay officials of Kamputhaw, Cebu City. 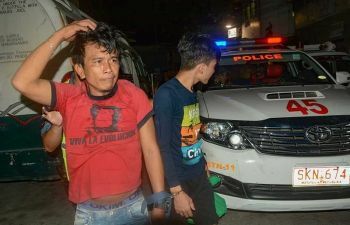 Roselyn Inoc, who hails from Mandaue City, was caught during an entrapment by operatives of the Intelligence and Detection Management Branch (IDMB). Barangay Captain Reponio Lequigan gave her P60,000 while Barangay Councilor Ronald Librando gave her P14,000 after she told them she needed money for her father’s medical expenses and, later on, for his burial. All of which turned out to be lies. “We don’t choose whom we help because we are in public service but we didn’t expect what she did),” Lequigan said in Cebuano. Last July 12, Inoc went to the barangay hall to ask Lequigan for help because of her ailing father, saying GMA 7 news anchor and Sun.Star Cebu columnist Bobby Nalzaro endorsed her. As he was a friend of Nalzaro, Lequigan gave her P3,000 and even asked other barangay personnel to contribute money to help Inoc’s father who was allegedly in the Intensive Care Unit. “She returned several times, asking for more money for medicines until her father allegedly died. Then she sought assistance because they wouldn’t release his body,” the barangay captain said in Cebuano. Lequigan said Inoc also used the name of former Cebu City mayor Michael Rama as he was identified as a member of Team Rama. When he started becoming suspicious, he called Nalzaro, who told him he did not endorse Inoc. Lequigan and Librando sought the IDMB to catch the suspect. Lequigan was initially duped because Nalzaro calls him “Tol” or “Brad,” which Inoc used in her texts. IDMB Chief Ryan Devaras said they arrested Inoc in a fastfood chain in Kamputhaw by coordinating with Lequigan. He said Inoc admitted that she belongs to a local group of swindlers operating in the city. “She has cohorts that tell her what to do and that’s why we will conduct a followup,” Devaras said in Cebuano. A certain “Dragon” is believed to be the group’s leader. Devaras advised local officials to verify referrals from prominent media personalities. “Name-dropping creates a big impact to barangay officials, especially from television personalities, and I suggest that they counter it by contacting the person if they really endorsed the one who was asking for aid,” Devaras said. Nalzaro during his news program Balitang Bisdak in GMA 7 reiterated the police’s advice to the public when someone uses his name to ask for money. “Give me feedback and always verify if the recommendations and referrals are authentic,” he said in Cebuano. Inoc will face charges for swindling in court.